Les and Linda (and Meg the Border Collie) provide a friendly welcome to their homely, traditional country cottage. 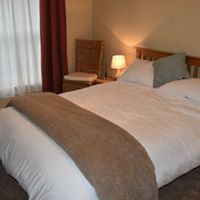 Facilities: There are 2 purpose built bedrooms. They are both en-suite with double beds, one has a walk in shower and the other a bath. Both rooms have Yale locks. The room at the front of the cottage is being used as a breakfast room. Finding it: Head out of Bollington towards Pott Shrigley. Take the third left after the mini roundabout, this is Beeston Mount. Head up Beeston Mount, then turn right into Cocksheadhey Road.